SEO – Search Engine Optimisation, or what I have to do to get my pages (and site) crawled over by Google (and other search engines) so I have a good chance of being found near the top of the search engine listings. You can see why SEO as a title stuck – short and pithy. Unfortunately, the subject itself is not. There are a myriad of tweaks and considerations when writing a page or blog, let alone the links and connections you make between pages or to other sites when constructing your own site’s web worthiness. You need time to examine the links and make your own personal judgments about how you use all this information, so do click on it to enlarge and examine how the links are made. Let’s just look at Content. This is a WordPress site, and so there are numerous clever people out there who create plugins that can support WP (for free). And, although born and bred SEOist will be sucking in their teeth, I realise I have a sprinkling of knowledge when it comes to SEO, using these plugins prompts the you to focus the mind more on what makes a page more likely to rank. 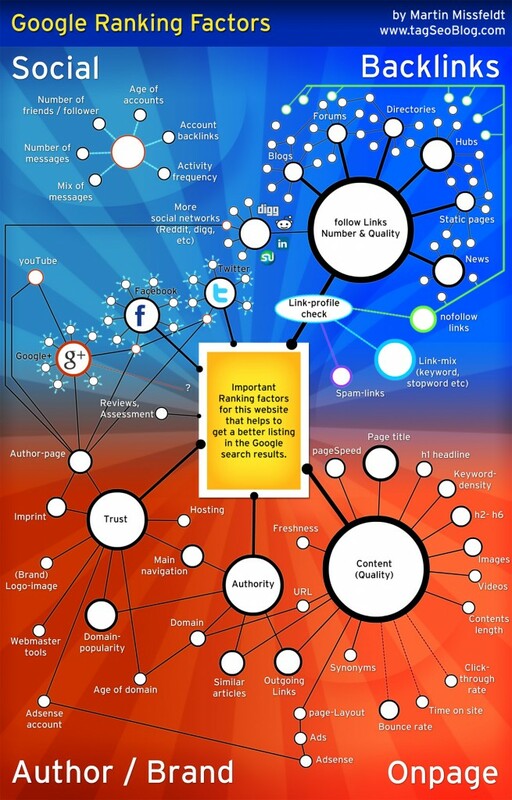 For example, having seen this fabulous infographic, I realised I’d not touched the thorny subject of SEO. The plugin asks for a search term, OK, that would be SEO. In the list of suggestions, I’m reminded that the term should be used near the opening of the post and reasonably regularly throughout. And that’s what I’ve found myself doing. The trick is the mix of ticking the SEO boxes (because let’s face it anyone can tick a box) and doing what the Googles of this world want – which is good quality content. And so your search terms need to be used in a natural and integral way within your writing. I’ve presumed the first four of Martin’s hierarchy have have been at the core of the algorithm for a long time, but it’s interesting to see how great a part Social Media plays with spreading the internet’s love. This was made in 2012. I wonder how much it is already out of date. And that’s the beauty of all this. The web continues to grow, not just in the unfathomable numbers that use it, but in the complexity with which it is used, and therefore the Gods that are Google continue to redistribute the weight and connections in their desperate need to find the best solutions to our requests. It all grows exponentially like a Black Hole and it is difficult resisting being suckered into the all consuming void. All we can do is write from the heart – corny yes – but from that stand point we at least communicate as human beings to each other. Surely that makes for a more interesting internet.